Growing up I always loved sugary sweet lemonades. As an adult I can't handle overly sweet beverages like that anymore. During the summer months you often hear how lemonade is refreshing. Well, I disagree. No offense to everyone that says that, however in my opinion lemonade is usually too tart to be refreshing to me. That is, until I tried Strawberry Lemonade! I managed to live 29 years in the Midwest (lemonade stands galore!) and never tried Strawberry Lemonade. What a mistake! I was hooked with the first sip. It's still a bit tart from the lemons, and a bit sweet from the strawberry, but not overpoweringly tart or sweet. Perfect! When looking through my Google Reader one day I came across this recipe I had starred and decided to try it. 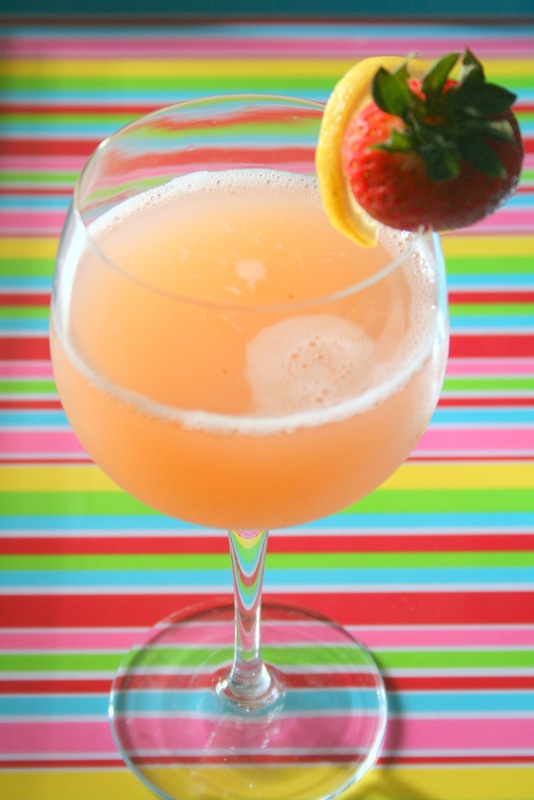 No, the weather hasn't been hot lately, but it will be soon, and I want to make sure I have a fantastic strawberry lemonade recipe ready to go. This is it! Not only is it slightly sweet, and slightly tart, but the kick of sparkling water (aka bubbles!) is perfect for a confirmed diet soda addict such as myself! To make the syrup, combine strawberries, sugar, lemon juice, water and salt in the bowl of a food processor or blender. Puree until smooth. Pour the mixture through a fine mesh strainer to remove the seeds, pressing down to extract as much liquid as possible. To make the lemonade, combine the hot water and sugar in a pitcher. Stir until the sugar is dissolved. Mix in the lemon juice and sparkling water. Stir in the strawberry puree. To serve, rub a wedge of lemon around the rim of the glass and dip in sugar if desired. Garnish with a sliced lemon or strawberry.